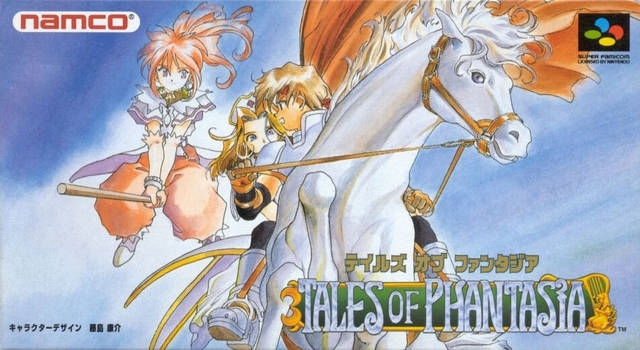 Released only in Japan, Tales of Phantasia innovated enough in the RPG genre to start the Tales of franchise that have more than 10 games today. 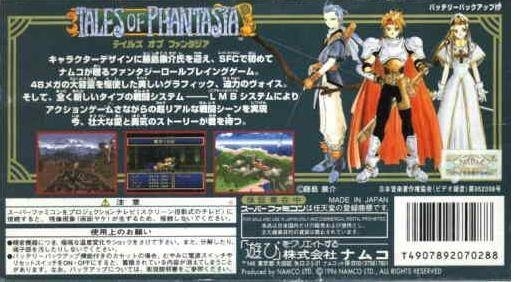 Tales of Phantasia is the best looking and most complex game (along with Star Ocean) developed for the Super nes. It is one of the few Snes games to feature real voice acting and a singed opening theme. The graphic was so good that later when Namco ported the game to Playstation and Game Boy Advance systems they had no problems with the game looking dated. The battle system was a hybrid of 2d fighting games and action RPGs. It is hard to explain but the battles were so fast paced that one could end them under 10 seconds or die in under 10 seconds. It was one of the first/few RPGs to feature a difficult level selection. It was the hardest of the non-action RPG genre. The player could control only one of the characters, the attack and techs were made by pressing the correct buttons or sequence of buttons. The other characters would attack on their own according to your AI settings (magic only, defend, support, offensive). The story was one of the strong points of the game and also one of the points that got into the way to make a US release. The game had swearing, religious references and sexual themes. It is nothing major today, but that was back in 1995. The game starts slow with Cless (main character) and Chester (his best friend) doing chores to help their parents on the rural village they live. Suddenly there is plot twist and a mysterious knight kills everyone on the village and burn their houses. Cless and Chester go after him to avenge their beloved ones and discover that the knight is not even the one in command. They must face the greatest enemy of mankind Dhaos. Dhaos caused destruction on the past and was responsable for a war that nearly destroyed manking. It gets much more interesting from here, but the game keeps the story simple enough for the players to understand. Sales for main series tales games in order of highest to lowest with multi platform sales combined into one figure. Please do not vote if you have not played the Snes version of the game. Do not give the game a 6 if you played the GBA or PSX version and disliked it.